The boulders themselves are on a piece of private property which can be accessed through a wooden gate. You can park just to the south of the first bloc, where you’ll find a small green patch on the left hand side of the road next to a bench and rubbish bin. From here you’ll just need to walk back 2 minutes to said gate and back up to the first boulder bloc. The easy access makes this a great afternoon and evening venue, which is only further enhanced by the West facing direction. On long summer evenings you’ll get sunlight until well into the night. The scenery itself if stunning and the location quiet and far away from the A9 highway. 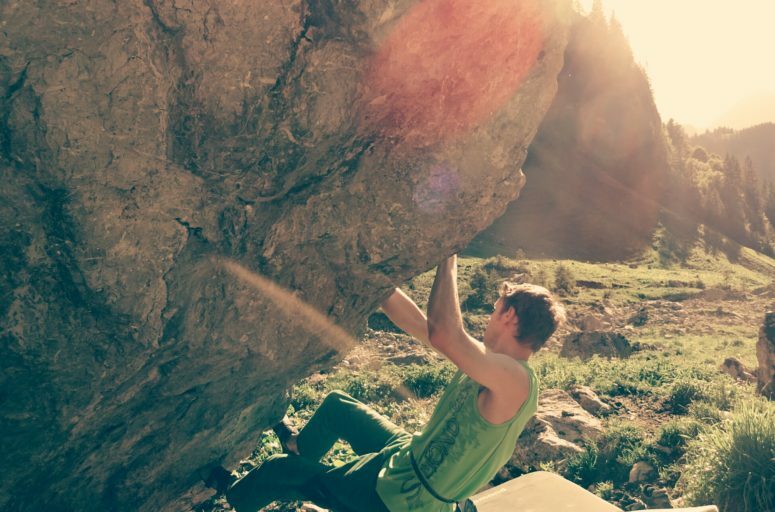 The bloc itself is famous for the titular ladder-like problem “Les Khmers Verts” a pristine 7a overhanging test piece with a furiously sketchy top-out. 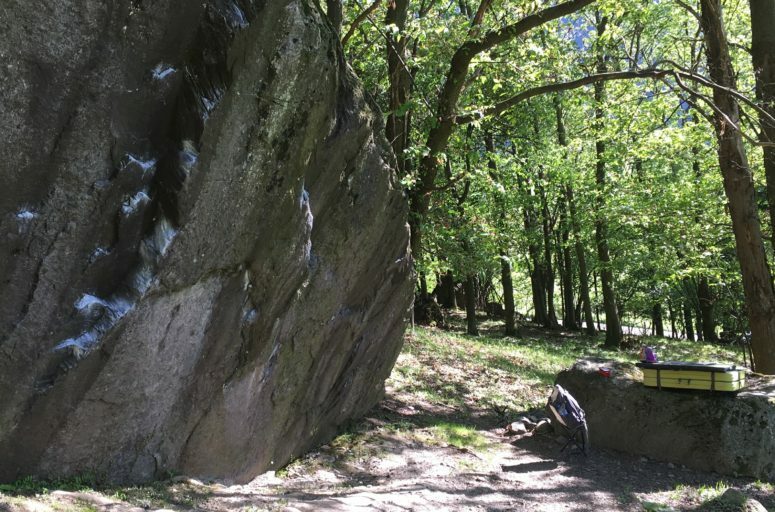 While there are some light warm-up problems on the left hand side of the rock, the area is generally hard and athletic featuring four 7a problems, one 7b and 7c a piece and then three 8a combinations. The landing area while smooth, is unfortunately slanted downwards and sideways at a fairly steep angle, which makes good spotting a must and adds some spice to the top-outs! 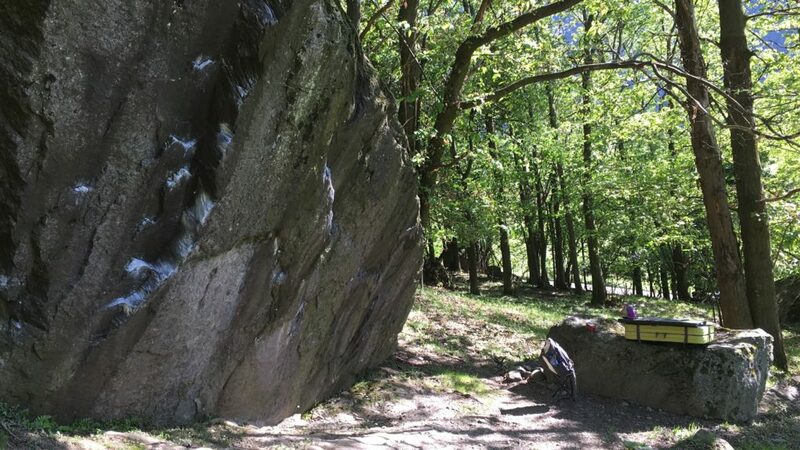 The second bloc is just a few metres further back into the woods, and features one tough but well-marked 7a+ sit start called “Macro s’affale” which features smooth rock to a nice top-out. 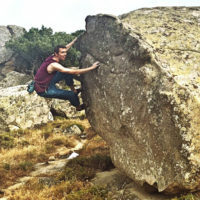 While the actual hand holds and crimps of the rocks are of very high quality, unfortunately, depending on the season the top-outs for most problems will be covered in thick green moss. 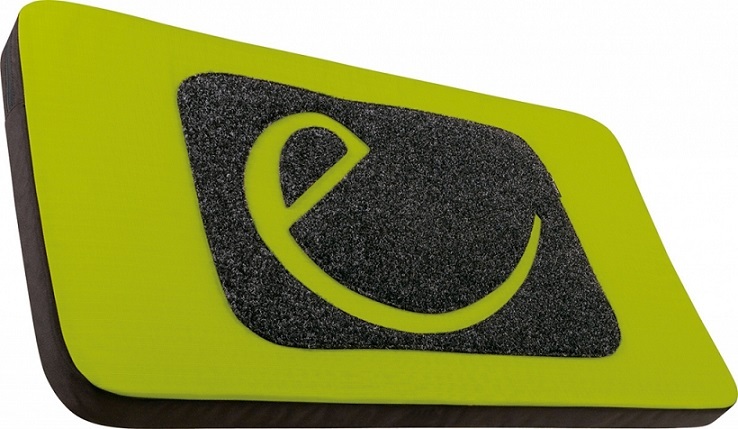 Take a brush along, and make sure to give the boulder a good scrub before training.